"This is “I’m done” gear. No more fussing. No more arguing. No more questioning. Done. This is smug, smack the Internet trolls in the face and chortle all the way, done. Finished. The sound in this room, to me, was clearly the best at the show. It wasn’t even close. Other rooms had different approaches, and featured different balances of the things I cherish. But for overall elegance, grace, charm and a natural effortlessness that is, literally, shocking when you first enter the room, this was it. Skadoosh." "There, in a system featuring TIDAL Contriva Diacera SE speakers driven by TIDAL Impulse solid-state amplifiers, a TIDAL Preos full-function preamp via Argento Flow and Flowmaster Reference cables, with source an Aurender S-10 music server and a dCS Debussy DAC. I heard a presentation more in line with what I expect from a high-end audio system: an even balance from the deep lows to the top audio octave, with a stable, well-defined soundstage, a tonal and spatial coloration-free view into the recording. 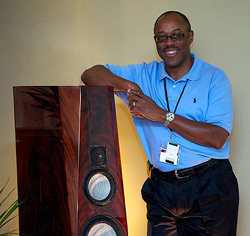 "I like to pretend that my first stop, after my visit from the heretofore absent-from-my-life Lotto Fairy, will be to Doug White of "The Voice That Is" to check out the latest and greatest from TIDAL loudspeakers. In the meantime, while I sit and wait for Godot, I got a taste of what my future (never hurts to dream) holds, here at Capital Audiofest. Doug had two rooms here, both showing TIDAL speakers. 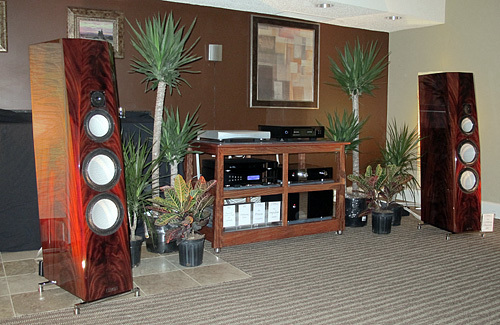 In the more expensive of the two, Doug was showing off his personal pair of Contriva Diacera SE speakers in a magnificent custom veneer. 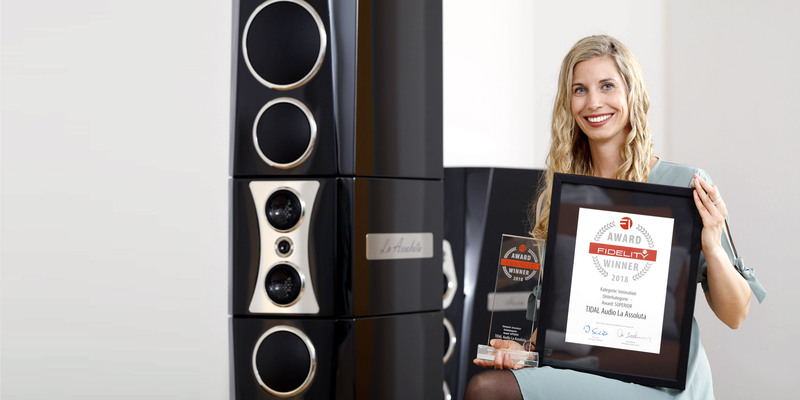 These pair speakers were actually the first and second off the line – as you can see from the engraved silver plaques mounted just over their rear-facing ports. Nice touch. The finish is something of a one-off, a super-dramatic custom-stained version of the standard-finish African pyramid mahogany. As Doug tells it, this finish took about six months of finishing and fussing over before TIDAL designer Jörn Janczak was happy with it – and once complete, said he'd never do again. Doug says he's never going to sell these, and quite frankly, he'd be nuts to do so. Interestingly, these speakers also predate the move TIDAL made to all-black Accuton drivers. 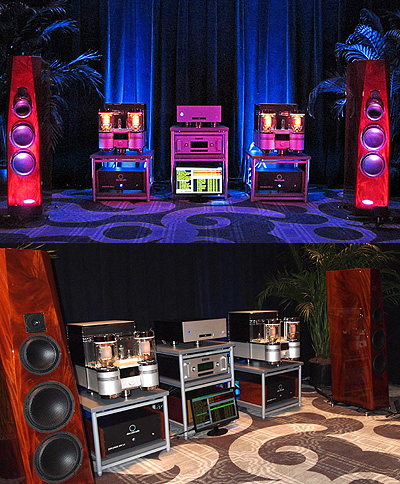 Anyway, these speakers were not only shockingly beautiful; they put out the most glamorous sound at the show." 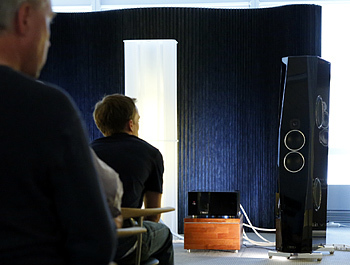 "One of the first really big systems I heard on day one was in the TIDAL/Argento room. Whilst the quality was apparent, it wasn’t really hanging together, but by the final day that had all changed. In fact, this was the best-sounding system I heard using a large conventional speaker system. Once it hit its stride, this system sounded open, delicate and incredibly transparent. The booming, disjointed bass that marred so many rooms was notably absent -- possibly as a result of the extra control achieved through biamping the speakers -- and all the more remarkable given the paired 11" woofers and three ABRs in each cabinet. Talking of cabinets, the Agoria uses a new material -- TIRALIT -- for its enclosure, and the absence of cabinet sound coupled to an extraordinarily low noise floor suggests that TIDAL are on to something here." "There are watershed moments that can mark a shift in a company's direction. Certainly, when TIDAL Audio of Germany introduced their Sunray loudspeaker back in 2003, that product informed TIDAL's offerings for almost a decade. But time and technology march on, and yesterday's flagship is, well, yesterday's news. The brand-new TIDAL Agoria might just signal the next watershed moment in TIDAL's relatively short history of competing in the Age of the Superspeaker. 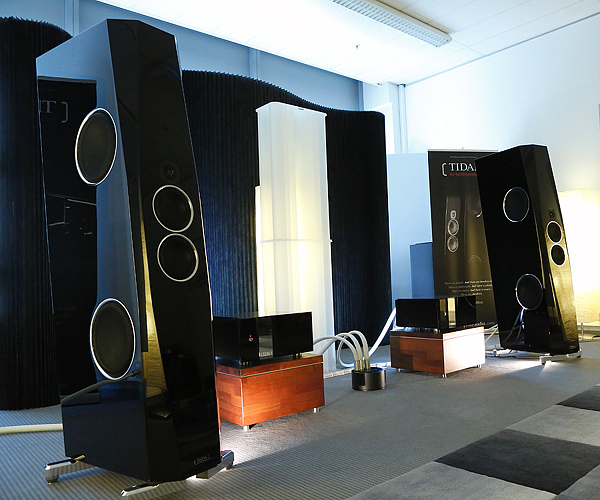 The release of the 450-pound, three-way floorstanding Agoria represents a number of evolutionary advancements in TIDAL's loudspeaker technology. Jörn Janczak, chief everything at TIDAL, was quite excited about its development. He shared a number of observations with me, and I could clearly sense his enthusiasm for the capabilities of this speaker: "When you see this more-than-200kg beauty, all its little details, these super-expensive drivers and so on, I hope you will see this is a very serious statement from us when it comes to superspeakers." "If better means even closer to the signal than the Contriva Diacera, then, yes, it is [better]. It plays deeper, has more dynamic headroom and higher resolution; it simply changes the signal even less than a Contriva Diacera. But these two models do not compete with each other since the sheer size (40cm-plus height) and weight (almost twice as much) is in a whole different class. Therefore, it can sonically cover way bigger rooms than the Contriva Diacera." Janczak's last statement convinced me that the Agoria represents an exciting next step for TIDAL, and perhaps will lead them to even greater accomplishments -- impressive stuff from this relatively young audio company. "One can easily recognize this speaker as a TIDAL speaker, but it also gives a hint of what one can expect from us in the coming years," he said. All audiophile eyes -- and ears -- should be fixed on TIDAL." 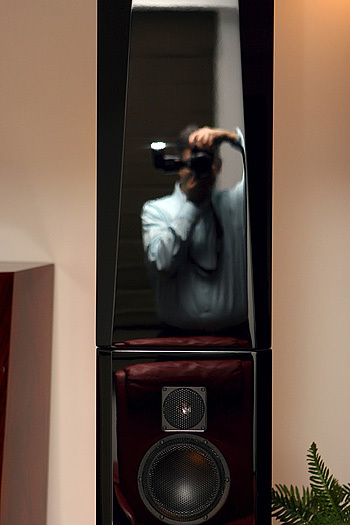 "TIDAL loudspeaker designer Jörn Janczak had given me advance notice of his newest loudspeaker in the Agoria, well before the Munich show, but I was still caught off guard over this tall and handsome transducer. The Agoria looks like a cross between TIDAL's top -of-the-line Sunrays and Contriva Diacera, sports two 11" side-firing woofers and three 11" sub-bass drivers -one rear firing. Of the seven speakers Janczak makes, this he says " ...is the first speaker with a cabinet made out of TIRALIT™, an all exclusive TIDAL cabinet material, which combines ultimate stiffness and resonance control. This wasn't the first time I heard TIDAL through their own electronics but I think this was a first for me in terms of this quality of sound. Using their own Impulse amplifiers and Presencio preamp, but also an Aurender music server from Widealab of Korea and Argento Flowmaster series cables, AC cords and connectors, I immediately fell for the sweetness of strings and voices coupled to a level of dynamics I had not experienced here in Munich." Jorn Janczak from TIDAL debuted his gorgeously built Agoria loudspeakers and electronics that included their new Impulse Reference dual mono amplifiers, the Preos-D Preamplifier with MC-phono and the Presencio 3 stack balanced Reference preamplifier (with a fully regulated power supply). 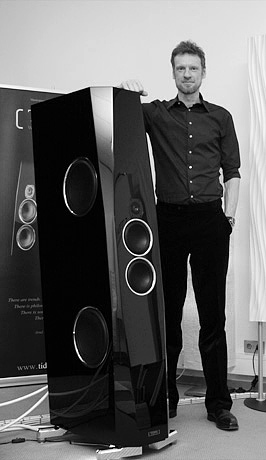 In many ways, the Agoria looks like a smaller version of their statement Sunray loudspeakers. In terms of performance, I found them stunning. Particularly in their ability to provide a three dimensional soundstage here at a trade show no less. The stage was as wide as it was deep with wonderful contrasts of dynamics. "Previous year TIDAL impressed in Munich with the enormous Sunray/T1 system, not only to me, also many other visitors. In Milan on the Audio Video Show TIDAL also ranked for me as one of the very best with their smaller systems. The Agoria does play the model placed below the Sunray and T1 and thus the second largest system of TIDAL. The Agoria is certainly not a small boy with a height of approx. 1.70m and a weight of 205 kg. Per piece. Also this year, TIDAL made the best out of the available space with acoustic adjustments... TIDAL scores again this year for me with one of the best sets of this show. " "I like the look. Very elegant. And the sound? What is the sound of one hand clapping? Yeah, I dunno either. So try this - extremely linear, with neither warmth nor leanness. Just pure, raw, speed. Not much to go on, is it? Hence, the koan. I struggled with this for a while, but all I heard was whatever we put into them. Got warm, lush, music? The Sunray will give you warm and lush. Got bright, harsh music? The Sunray will give that to you, too. Got the most amazingly well-recorded, super-dynamic, large-scale, power-hungry tour-de-force on disc? Well, guess what. The Sunray is going to light it up like you’ve never heard it before. "No one is ever going to accuse TIDAL Audio of making audio products for the masses. Their line, their entire line, is all about luxury. Top shelf luxury, at that. The level of fitment, the finish, the quality … it all oozes out of these products in a gentle cloud of ease and refinement. You’ll “ooh” and “ahh” when you get too close to their raw magnetic appeal. It’s inevitable. I wish I could afford this kind of gear. It’s nice to know that the manufacturers that offer products in this class aren’t just insane or trying to pull the wool over your eyes. TIDAL, at least, obviously cares - about everything. Every little bit or bob was thought about, and quality was always selected for. It’s reassuring. It’s comforting, even if it’s out of reach of most of us. But when that Lotto Fairy comes calling, I know who’s getting the first call." Please feel free to read the whole text, if you like, here: http://parttimeaudiophile.com/2012/04/09/a-visit-to-the-voice-that-is/There’s a lot going on here. Me? I’m (now) a huge fan of Accuton drivers, but here, they’re only part of the story. 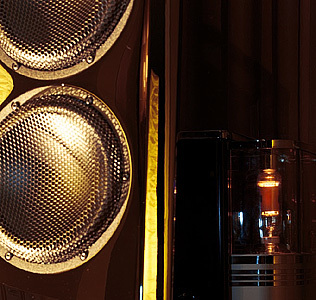 Give some respect where it’s due - the diamond Diacera tweeters are simply out of this world. No etch, no grain, no whatever-might-be-code-for-bad. Its all good. ...And all built to that same ludicrously high level of detail and finish that you’d expect and didn’t know you really cared about. This is like passing over a Rolex in favor of a Patek-Philippe. If you have no idea what I’m talking about, no worries, just move along." "Audio Power Labs: they must be selling some of them or gotten a capital infusion because their demo equipment keeps getting better and better with each show... 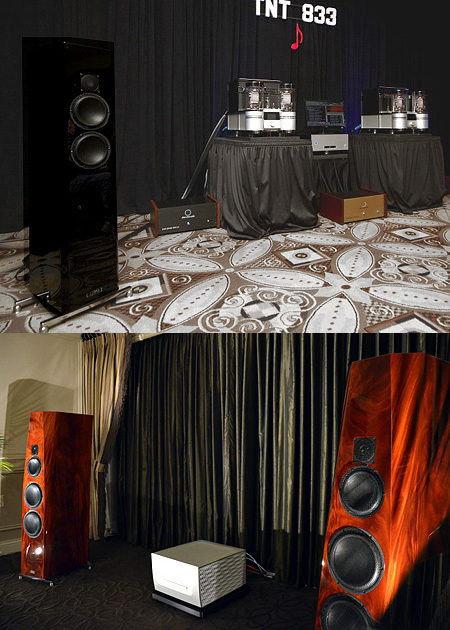 TIDAL Contriva Diacera SE loudspeakers, which I would give my right arm and then some to own. Frighteningly good sound." Great room, great sound and one that I was happy to return to over and over again during my too-brief stay. Well done." Although Misty Ellis' atmospherically lit room was a challenge to photograph, the sound this company from Columbus, OH put together from a big-bucks system headed by the Audio Power Labs 833TNT 200W transformer-coupled monoblocks, TIDAL Audio Contriva Diacera SE floorstanding speakers and Laufer Teknik The Memory Player 64 was as tantalizing and satisfying as its visuals. On my second visit, I was won over. An unfamiliar track, Richard Bona's "Reverence" from the album Cameroon, sounded superb. Then we turned to one of my trusty reference standbys. With the room as dark as it was, yours truly inadvertently pulled out the second disc of the two-disc Mahler set, which begins with the third movement of the five-movement symphony. Once over my surprise at hearing the wrong movement, I settled in to listen to the entire thing. It was that enjoyable. ...this system did so much so well that it earns a deserved place on my AXPONA Top 4 list." "I’ve heard various TIDAL speakers over the last year or so and I have to say, they’re on The List Of Things To Get When I Become Rich Enough To Afford Them. Actually, from that lineup, the Sunrays take top billing on that list. "....No matter how good or expensive this or any amplifier is, they all require a source to play from, and a good pair of loudspeakers to show off their remarkable harmonic prowess. I think they came very close to achieving this goal with the speakers they chose for this event. The TIDAL Piano Cera's are not cheap though they reside nearer the smallest and least expensive of what the company builds. That said, I have visited their facility in the city of Cologne, Germany. It was here where I found its designer Jörn Janczak, used the same expensive parts internally as in their top-of-the-line $150k Sunrays. To me, that means a lot in terms of what one should come to expect from TIDAL and their least expensive pair of loudspeakers. As a result, I find the Piano Cera's to be among the most neutral sounding - yet full-bodied - loudspeakers to grace my listening space and as a result have officially used them as a reference in their price class (and am certain they perform way beyond their asking price)." 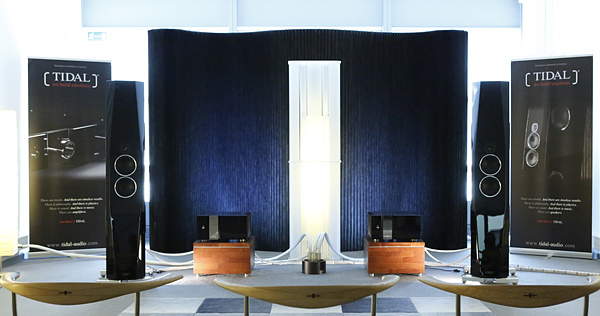 "The Constellation Audio value-oriented Performance components paired with the TIDAL Contriva Diacera loudspeakers reproduced some of the most sublime music at the show." "Constellation Audio introduced its new “budget” line of electronics in the company of TIDAL’s gorgeous three-way, ceramic-and-diamond driver Contriva Diacera, and made the best sound I’ve ever heard from a TIDAL loudspeaker. ... dynamics and resolution of detail were simply superb."